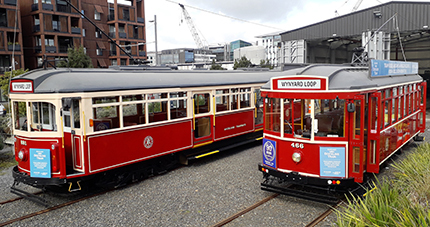 Get off the Auckland Dockline Tram at Jellicoe Street stop - it's all go! Walk, watch, eat and enjoy. There’s something for everyone. The name says it all. Silo Park, at the western edge of Jellicoe Street, features the retained 35 metre Golden Bay cement silo and ‘six-pack’ in recognition of the area’s industrial heritage. Enjoy an outdoor cinema on Friday evenings, a funky children’s playground and take a leisurely walk to the end of Beaumont Street for fabulous views of the Auckland Harbour bridge. Enjoy a wander down Jellicoe Street, a pedestrian-focused boulevard utilising Auckland’s indigenous flora to create both a memorable landscape and functional rain garden to treat storm water and provide passive irrigation. An eclectic mix of cafes and reataurants where you can enjoy coffee or lunch and watch the fishing boats unload their catch. A pleasant walk along the promenade will allow you to enjoy the wonderful smells emanating from these popular eateries. Auckland Fish Market is an exciting concept in seafood. They have the widest range and freshest seafood available, straight from their boats to your table. The Fish Market building hosts a variety of fresh seafood retailers, a boutique food market, restaurants, licensed cafes, an extraordinary wine encounter and the ever popular Auckland Seafood School. 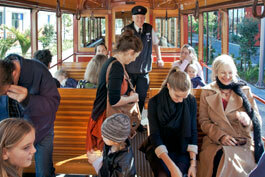 For passenger and car ferries across the Waitemata Harbour to Waiheke Island and Great Barrier Island. 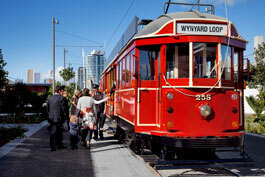 Find out more about Auckland Dockline Tram on our frequently asked questions page.